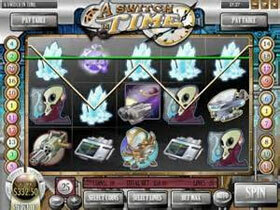 A Switch In Time is a fun travel-themed Slot consisting of 5 reels and 20 paylines. This slot is the newest invention by Rival casino that transports players through time and space, beyond the limits of our imagination. Players will travel to 3 different time periods where they will make some friends, enemies and even save the day. 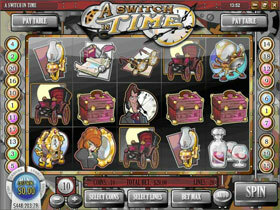 The A Switch In Time video slot has over 31 different winning combinations. The icons include older models of cars, glasses, watches, tool boxes and even the scientist is older looking. The Wild icon is represented by the Hour Glass and substitutes for all icons except the scattered icon, which is the Young Girl and the Time Machine Bonus icon. This innovative slot will invite players to visit an old house where the past still exists, the present isn't fleeting and the future is known. The older looking professor will help players to seat themselves in the time machine and to get ready for traveling to the 6th dimension "playtime". The Wild icon in each stage of the Slot is worth 6789 coins top Jackpot when a player hits five of them on an active payline. During normal play this Wild icon will act as a 2X multiplier and a 3X multiplier during Free Spins. In the opening stage of the game, the Wild is represented by the Hourglass icon. In the past tense, it will be represented by the Campfire icon. In the future the Wild icon is represented by the Purple Cloud icon. 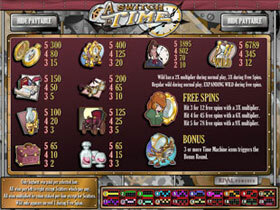 The A Switch In Time slot will suit gamblers that enjoy playing the Penny Slots as the minimum coin denomination is $0.01 and the maximum is $0.25.